There are 27 holes in total, three 9-hole, A, B, and C Courses. The A&B Course is the best combination. 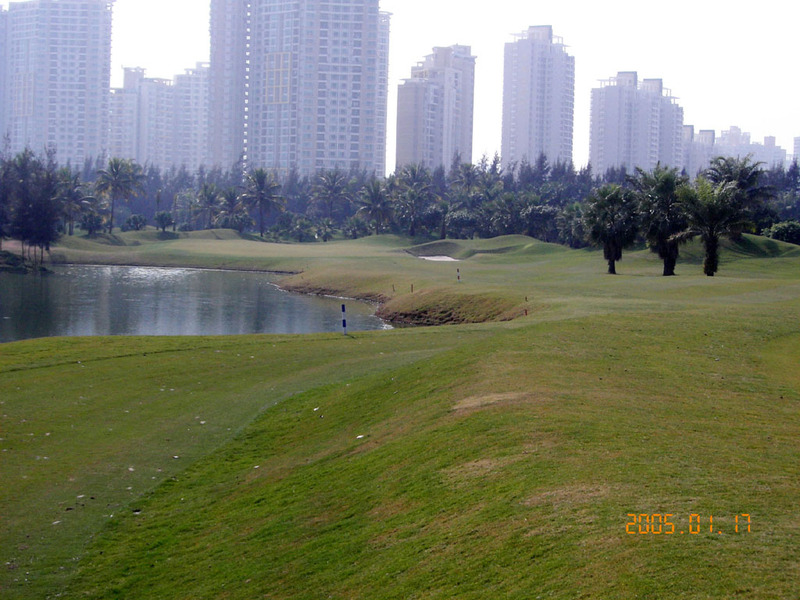 The layout is very demanding and ponds and bunkers are strategically placed. Unless you target landing areas and hit precise shots, you can’t have a good score. 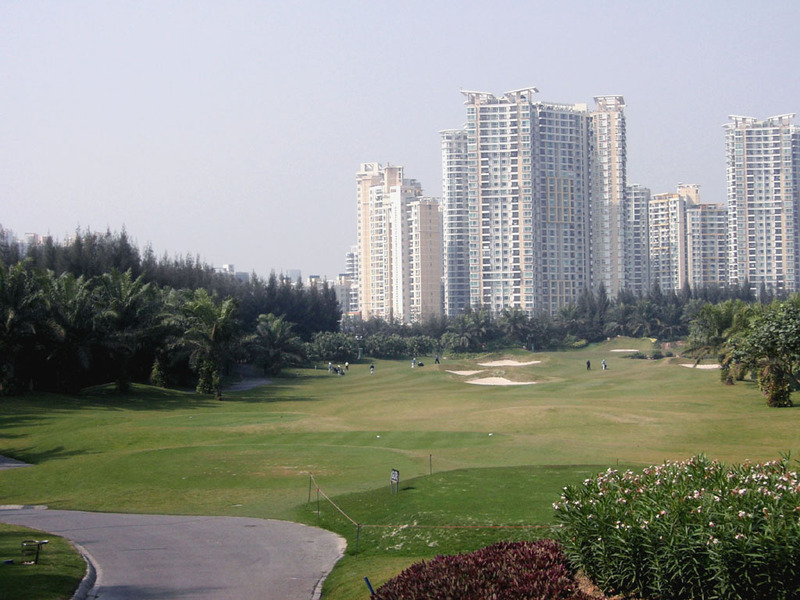 Greens are fast and roll smoothly, and they are excellent, probably one of the best in Shenzhen and Hong Kong. 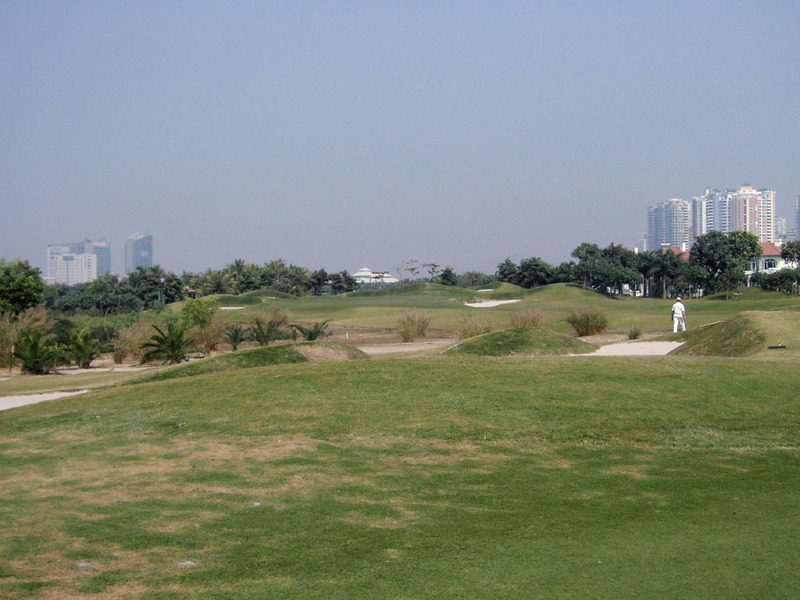 This is the course that will be appreciated very much by the low handicap golfer because it demands excellent shots and deft touches on and around the green. 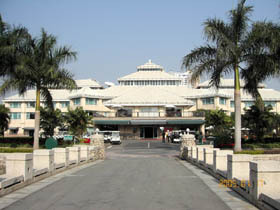 Although the course is located in a city, it has a tropical atmosphere blended in with the beauty of the Gary Player’s unique design. 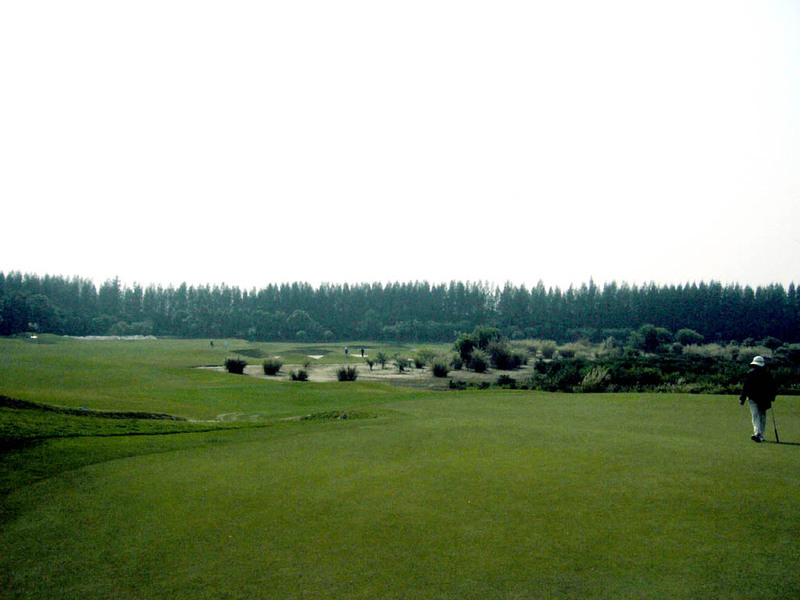 When I played the BC course in 2003, the overall rating was 4.20, compared to this 5.15 of the AB course, because the A course is the longest and the most challenging out of three 9-hole layouts and the C Course is the shortest and has not as great layout as A or B. 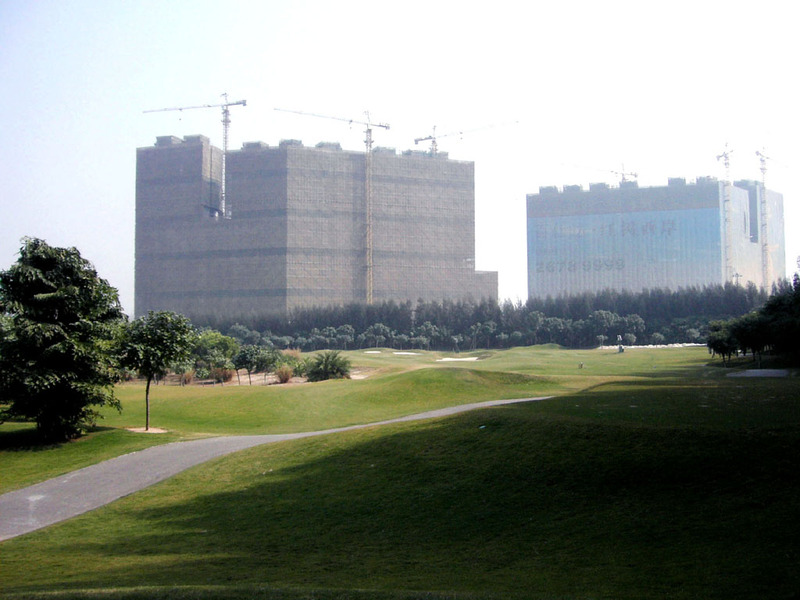 However, you have a lot of views of modern buildings behind the greens and fairways as seen in the picture on the right when you play the C Course. 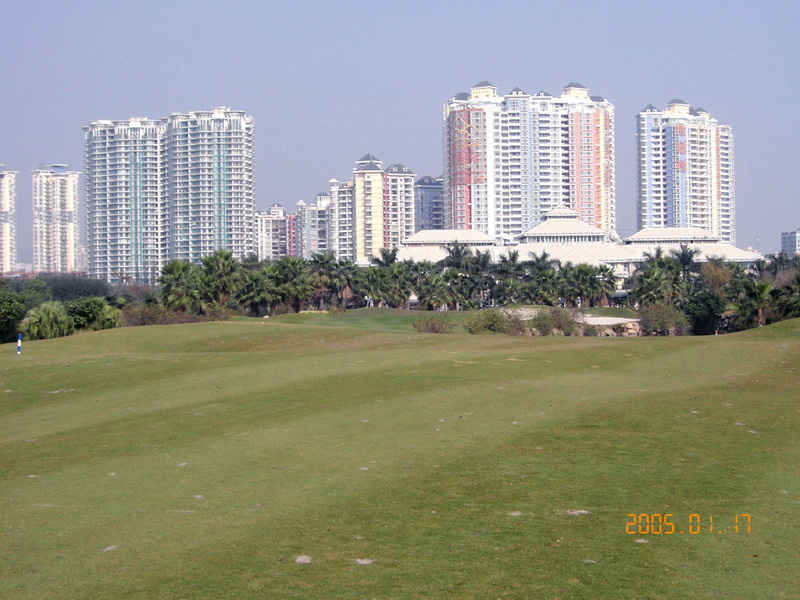 This is unique because the natural golf course is such a contrast to the man-made buildings. 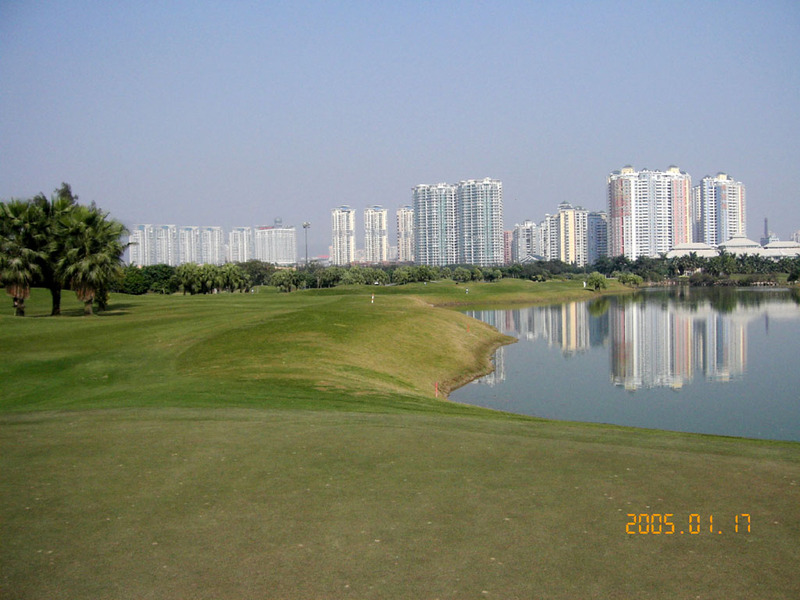 It is very fun to play in the C course 4th hole, a par 4 where you hit the second shot hit toward modern-looking buildings standing behind the green and 5th hole, a par 5, where all of the left side of the fairway faces the pond. 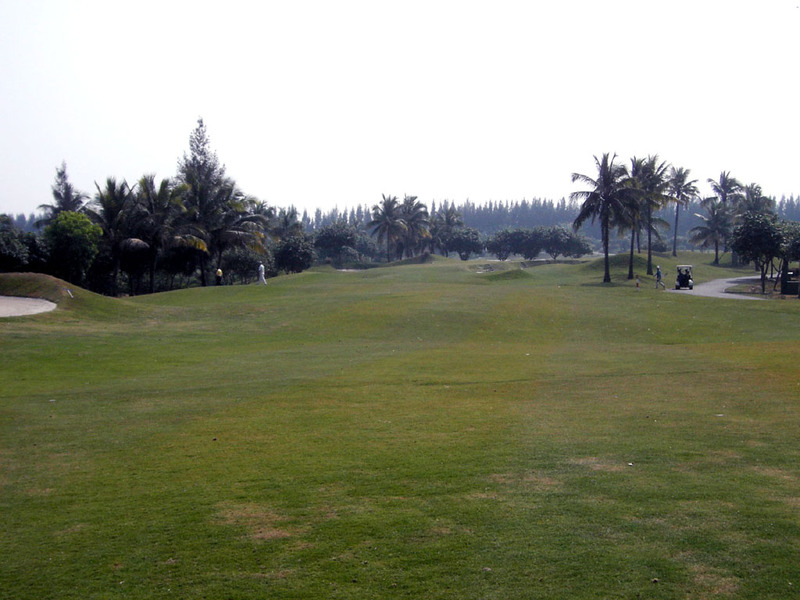 A long distance par 5 with a slight dogleg to the left at first followed by a slight dogleg to the right. A bunker on the right and a lake on the left of the relatively narrow fairway come into play off the tee, so an accurate drive is needed. The closer to the green, the narrower the fairway becomes with a howe guarding its left side, which makes you consider how to hit the second shot. Be careful of the big bunker protecting the right side of the green because it is deep. 3 bunkers side by side in the center split the fairway. 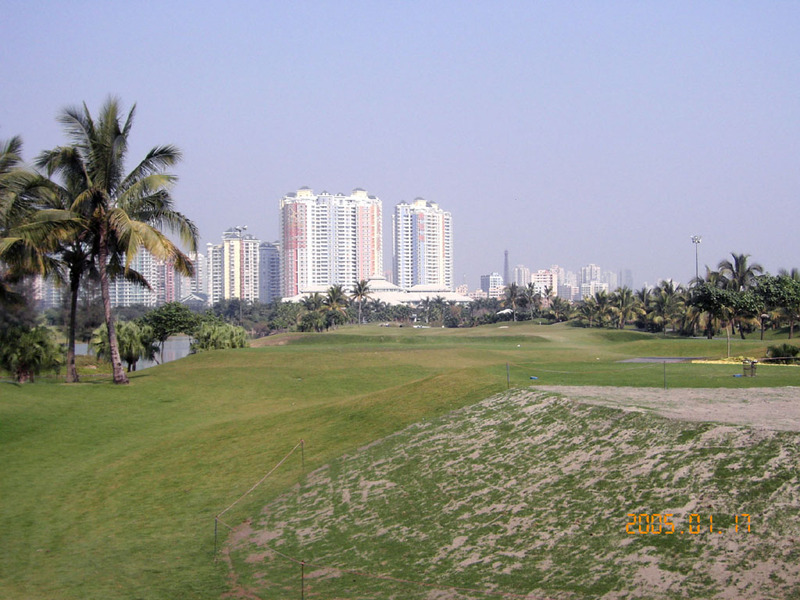 The contrast seen from the tee between beautiful modern buildings behind the greens and the natural view of this hole makes the entire scenery unique. When the pin position is right on the shallow green, the second shot must be the right distance because the green is not deep and its front is protected by water. 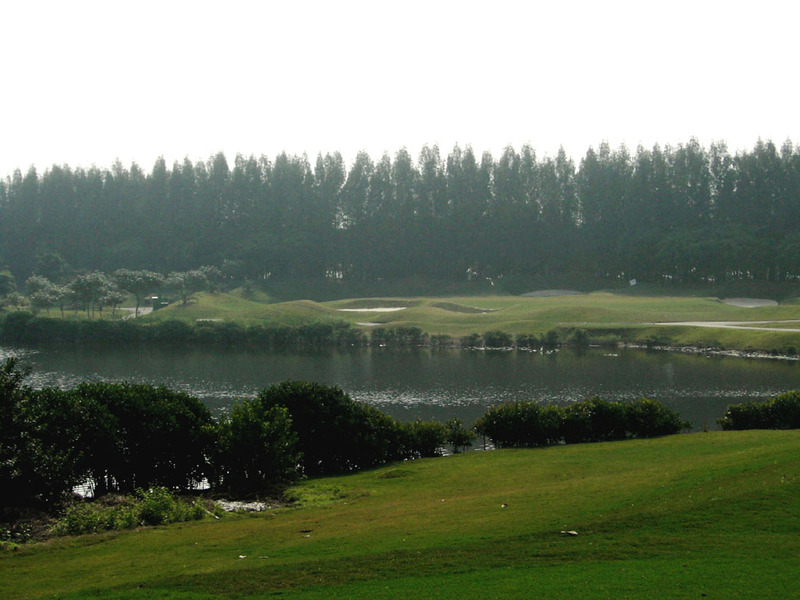 A charming par 3 over water and a bunker. 3 long bunkers surround the green. 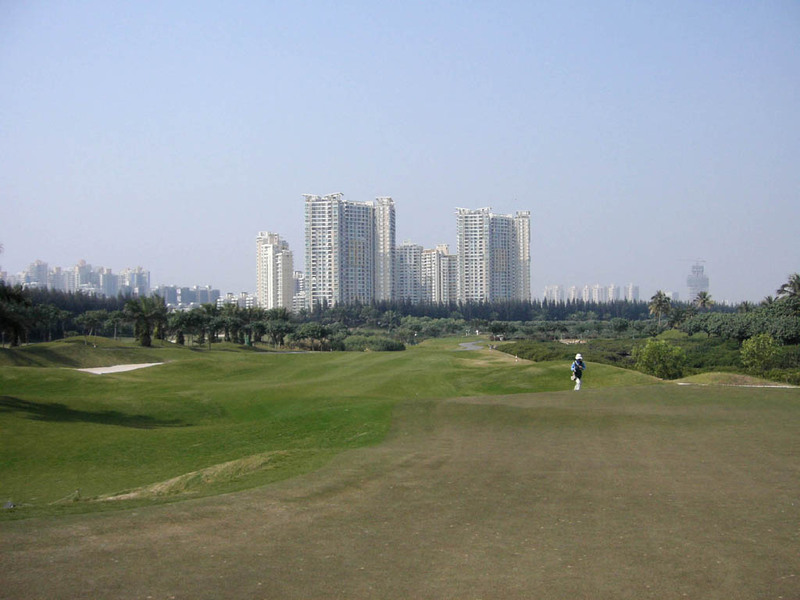 A long and difficult slight dogleg to the left with the green swung further to the left. 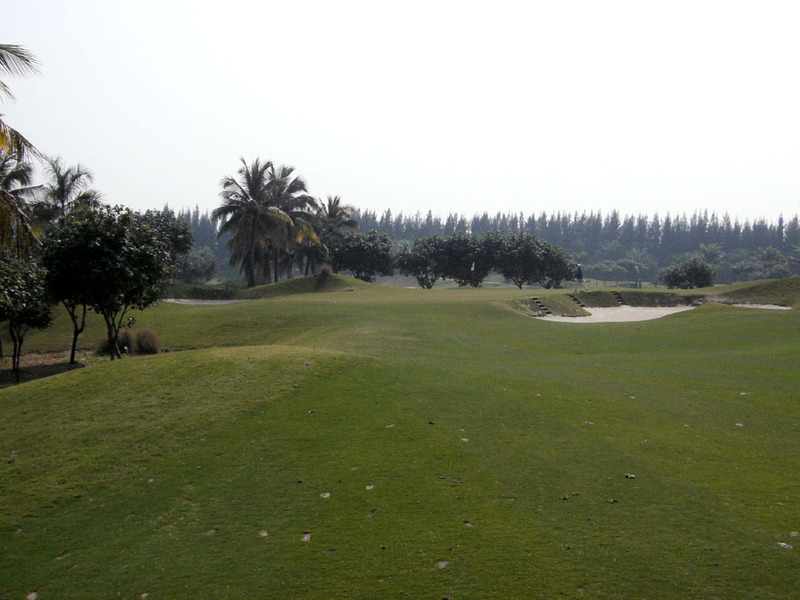 Double fairways are provided on both sides of the bunker in the middle, the lower left one and the higher right one. The left one can shorten the distance to the green but its left side borders a lake. 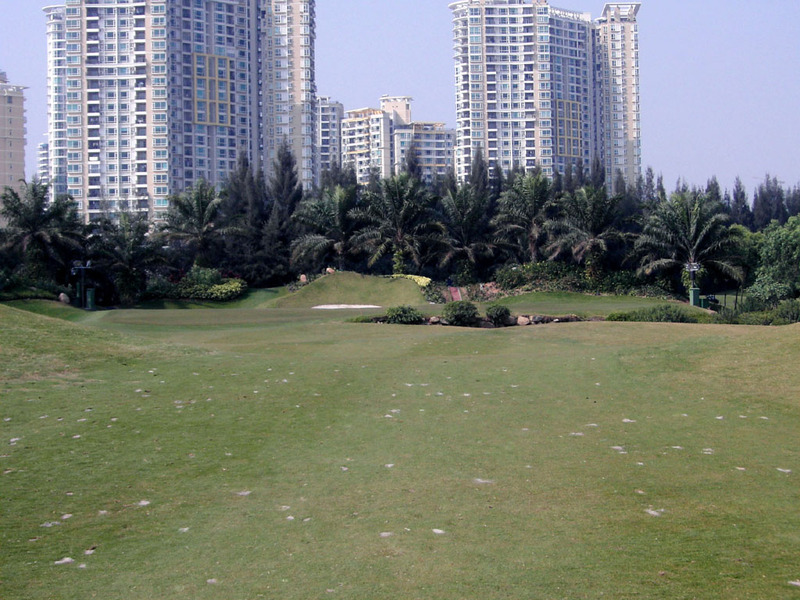 You should hit the right, wider fairway to have a better angle to the green. 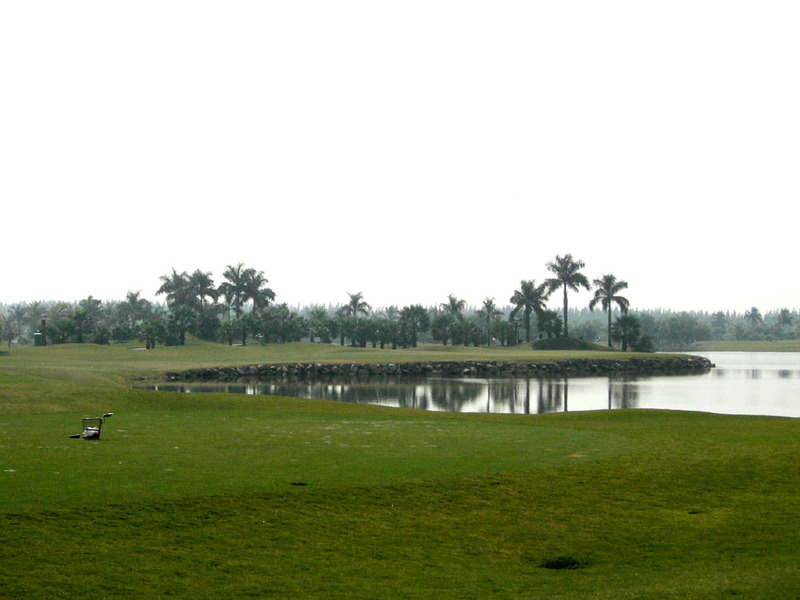 Most of the fairway in front of the green is squeezed by the lake, so the approach shot is especially tough. An almost straight hole. There are palm trees on the right and a lake on the left, so an accurate drive is needed. 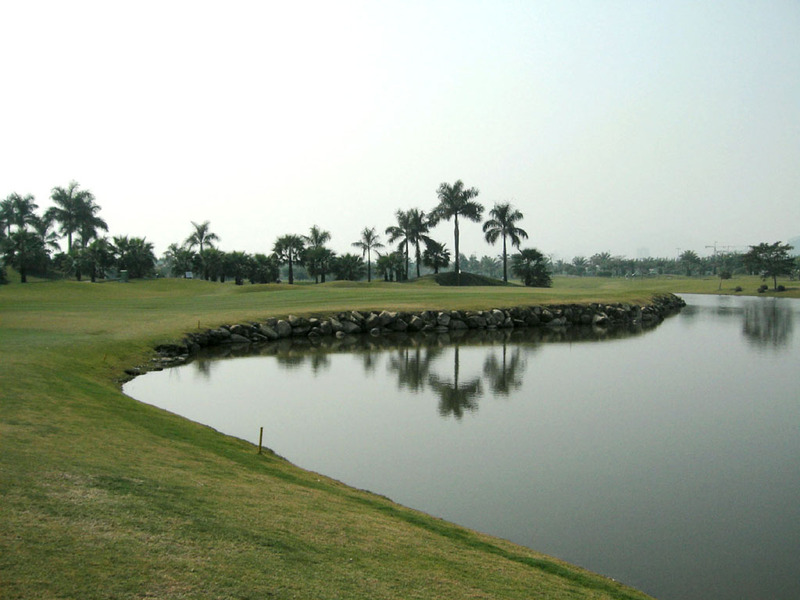 When the pin position is on the right, the second shot becomes extremely difficult, because the shot requires you to hit over water and a deep bunker into the wide and shallow green whose left side is also guarded by water. A beautiful par 3. The green is notable because it is 50 yards wide with moderate undulations. A 90 degree dogleg to the left. This is a long par 4 with a rolling fairway. The best route is to hit on the right side of the left fairway bunker, then you can cut 30-40 yards off the indicated distance. Even if your ball is in that bunker, it is so shallow that you can get a shot at the green from there. If a ball goes left of the bunker, it will disappear into a hazard. You need to carry 200 yards over water. You had better hit long over the green rather than short because you still have a chance of making par. If you slice the ball too much, the water hazard on the right of the green will catch it. 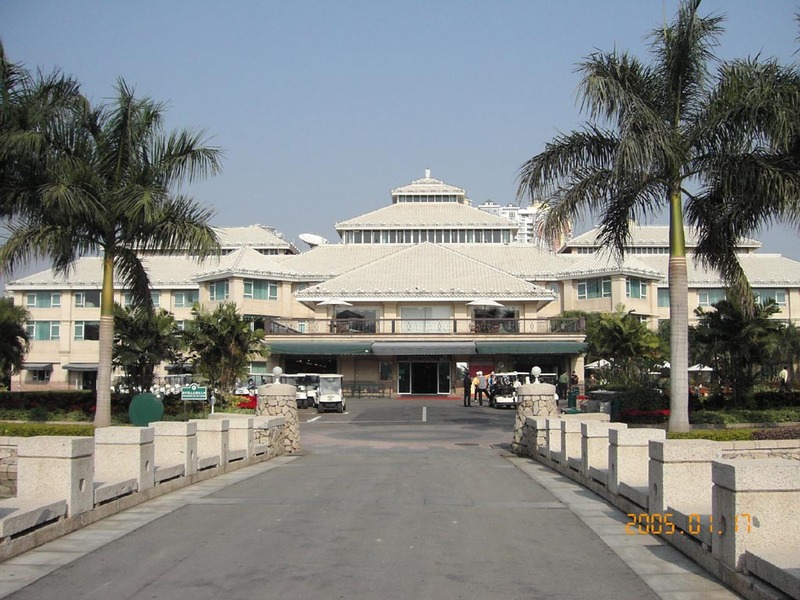 You can stay at a hotel next to the clubhouse. C course is equipped with lighting for night golfing. I could play from the longest tees by showing the starter a single handicap certificate. 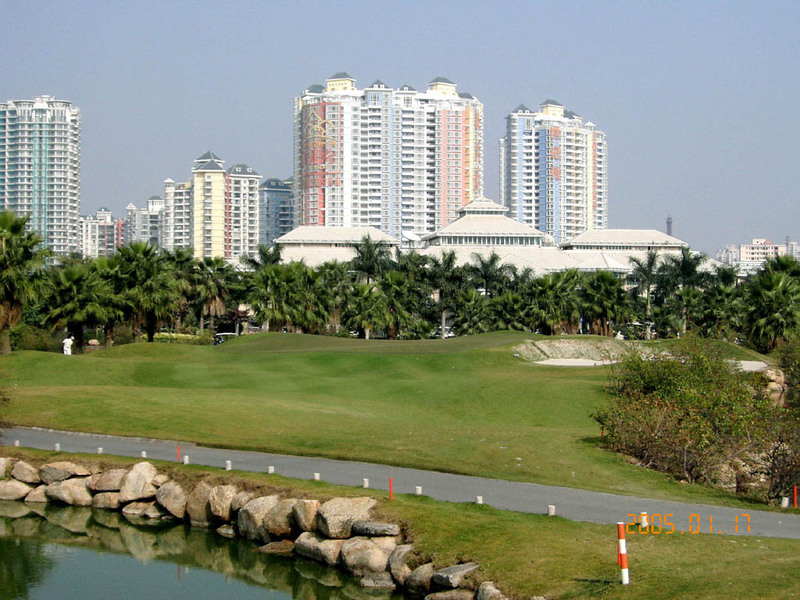 Gary Player designed 200 courses in the world, about 30 of them in Asia. 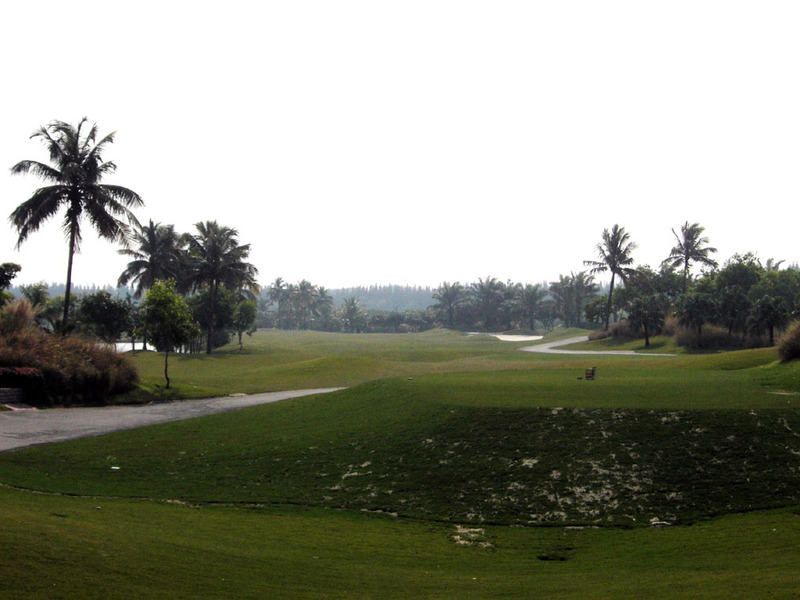 The most famous are Kai Sai Chau Public GC – North Course in Hong Kong, Ria Bintan Resort in Indonesia. 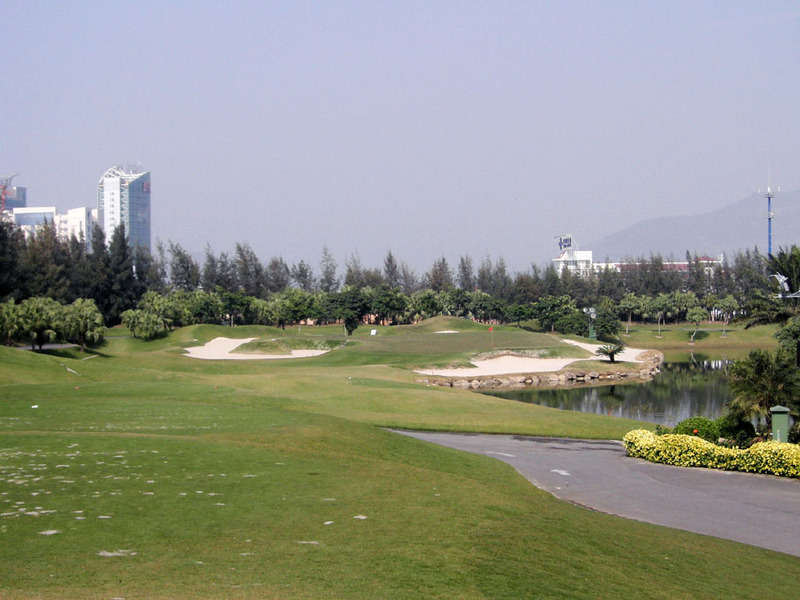 The other courses are Manna CC in Japan and Sriracha GC in Thailand, Zhaoqing (肇慶) R&GC in China, and Puerto Azul Beach & CC and Orchard GC – Player Course in the Philippines.